The secret ingredients in this crisp recipe are cashew butter and applesauce! They work perfectly to replace butter and are neutral in flavor so you wont’ even detect any difference. I wish I could take credit for the brilliant idea to sub cashew butter for dairy butter but I owe the magic to Isa Moskowitz from Post Punk Kitchen. I wanted to revamp my very own Cranberry Apple Crisp recipe and make it plant based/vegan friendly and when I saw Isa’s recipe for a fruit crisp in the Forks Over Knives cookbook I saw how easy it would be. Cooking the plant based way is different but once you get the hang of it, you realize how simple it is. I didn’t have any cashew butter on hand so I made some in my Blendtec blender in just minutes. Cashew butter is sold at health food stores, Whole Foods and some grocery stores and will be located on the shelves near the peanut butter. 1/4 cup real maple syrup – adjust depending on how sweet the apples are – you can use up to 1/2 cup if needed. Preheat oven to 350 degrees. Spray 2.5 qt casserole dish with non stick spray. In a medium size bowl combine prepared apples, with cornstarch, cinnamon and nutmeg, add lemon juice and maple syrup stir to combine and pour apple mixture into prepared casserole dish. In a small bowl combine oats, oat flour, walnuts, cinnamon and nutmeg, stir to combine. In a small separate bowl using a wire whisk combine vanilla extract, cashew butter, apple sauce and maple syrup – whisk until smooth, add to dry ingredients and stir with a fork until its well combined. Spread topping evenly over the apple/cranberry mixture. Bake for 40- 50 minutes in preheated oven or until apples are fork tender. Serve warm with your favorite non dairy frozen ice cream or banana soft serve. Delicious! 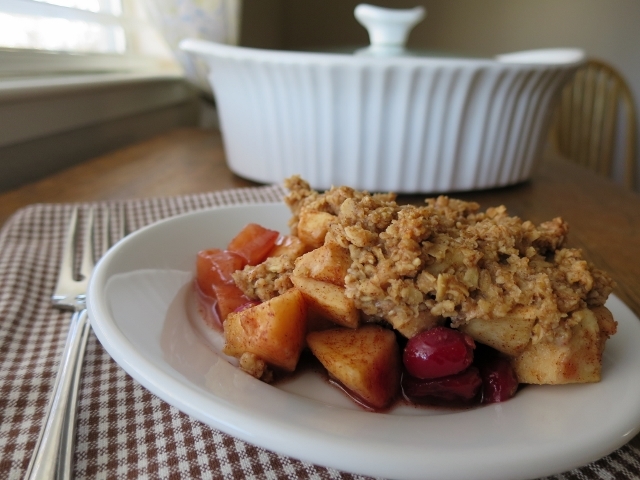 This recipe is my standard Cranberry Apple Crisp recipe revamped to be plant based/vegan by using maple syrup in place of sugar, cashew butter and applesauce in place of butter and oat flour in place of wheat flour.